Harrington is the author of two well-received Irish historical romances and the critically acclaimed Murders by Design series, reprinted by Harlequin for its Worldwide Mystery series. “Bitchy back-biting, and even greed and murder are here, but so are goodness and kindness, real girlfriends, and even true love. [….] In Murder On Pea Pike, with deft strokes, Harrington sketches Honey and Amelia’s thin lease on success in a town without boundless choices or resources. [….] Harrington’s pages are full of catty looks at rival’s clothing choices, drawled comments that are double-barreled, and everyone knows it but plays the game; the scent of perfume, a hidden bottle of bourbon, and always the knowledge that one must live by one’s wits, but in so doing, one tastes the delight of living.” Read more…. “The author Harrington has an eye for the ridiculous in human nature, and she takes advantage of her characters’ foibles to concoct a spirited, suspenseful tale with equal measures of comedy and compassion.” Read more…. 5 Stars: “Honey just stole my heart. She’s smart, plucky, and it was pure fun to walk in her shoes.[….] Loads of fun, strong writing that just flows right along and one of the most satisfying and surprising endings I’ve read in quite a while.” Read more…. “Honey is an engaging, forthright amateur sleuth. If you like your mysteries with a Southern flavor and a dash of sass, try Murder on Pea Pike.” Read more…. 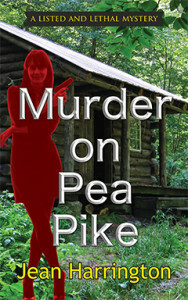 “Murder on Pea Pike by Jean Harrington is a fun whodunit. Whether you like them or not, the characters are quirky and entertaining. Honey is a likeable diamond-in-the-rough, and it is fun to watch her character evolve into a more sophisticated woman.” Read more…. Fresh off her ex-boyfriend’s Harley and determined to remake herself, Honey Ingersoll snags a job with handsome Sam Ridley, Eureka Falls’ biggest realtor. She’s thrilled, but her troubles are far from over. During the sale of an abandoned farmhouse, she stumbles over the body of a young woman with big hair, silver stilettos and a bullet hole in her chest. A few days later, she discovers uncut diamonds on neighboring farmland. The owner turns up dead soon after—and once again Honey finds the body. Sheriff Matt Rameros, who’s sweet on Honey, believes the two incidents are unrelated. Honey, now a person of interest in the murders, thinks otherwise. Why else would Sam Ridley, a big Fayetteville financial concern, and a U.S. senator all have an interest in these hardscrabble properties? Honey has to find out, or she may have fled a double-wide only to end up in a jail cell. Or worse. Jean Harrington’s first job was writing advertising copy for Reed & Barton, Silversmiths. Then for 17 years, she taught English at Becker College in Worcester, Massachusetts, where she also directed a peer-taught writing center. After moving to Naples, Florida, she began to write murder mysteries. Jean is a member of Romance Writers of America, having served two terms as president of her local Southwest Florida chapter; International Thriller Writers; and Mystery Writers of America. For more information, click here. An empty car parked by the side of the road caught my attention. I drove by too fast to catch the license plate number, but unless I was mistaken, it was that girl’s, Tallulah Whatsername’s, sapphire blue Caddy. Hmm. If that didn’t beat all. There wasn’t a house or a store within walking distance, not in a pair of silver stilettos. Maybe she’d had engine trouble, and some good ol’ boy had picked her up. Strange, though, she hadn’t used a cell phone to call for road service. Or maybe she’d changed her shoes and gone for a tramp in the woods, but I doubted it. She hadn’t looked like the type of gal who was into nature trails. I nearly stopped and backed up to make sure she wasn’t in trouble, but I was already late and couldn’t afford to botch this deal. Besides, Tallulah had struck me as a girl who could take care of herself. But just to be sure, as soon as I got to the farm, I’d call 911. Five minutes late, I turned off the pike onto the rutty lane that led up the rise to the Hermann place. The house, an unpainted chink-walled log cabin, had a saggy shake roof, its only bragging point a fireplace somebody had built by hand years ago, one stone at a time. In the gravelly patch fronting the house, a rusted-out Ford pickup sat on four bald, flat tires. So, Mr. Ames hadn’t arrived yet. At least I didn’t think he had. He’d sounded too interested in the place to have driven off in a huff over a five-minute delay. Fairly sure he’d be by in a little while, I parked, made the 911 call, then strolled across the scruffy yard to the cabin door. The double wide I grew up in had been bad enough, but this was worse, far worse. Hoping the splintery boards would hold a hundred and fifteen-pound woman—well, one eighteen—I ventured onto the porch and pushed open a squeaky door that had never known a key. Something small and furry scurried out of a moldy chair in the front room and disappeared into what passed for a kitchen. A mouse. I shuddered and told myself to toughen up. Selling houses in rural Arkansas wasn’t for sissies. No one had shown an interest in the place for over a year, and that was easy to understand. It was damp and dirty, with cobwebs hanging in the corners and tattered rags at the windows. Worse, an outhouse odor rose above the dampness. A squirrel maybe. Or a ’possum. I tiptoed across the creaky floor. How would I explain the odor to Mr. Ames? I hoped it wouldn’t matter. He might be planning to tear down the cabin and build a brand-new house. Or he could have an interest in history—it was my understanding some people were keen on it—and planned to take the warpy old place apart, board by board, and rebuild it as a tribute to the past. No matter. Whatever his interest might be, I’d base my sales pitch on the beauty of the scene, the acreage, the privacy. Phew. That odor was mighty strong. I left the door open to the fresh air and, with my pulse revving up a bit, peered into the back room to see what critter might have died in there. I couldn’t believe my eyes. They were lying to me. They had to be. But then I did believe, and a scream ripped from my throat. Stretched out on her back, the silver stilettos still crisscrossed to her knees, Tallulah Bixby lay in a puddle of blood with a bullet hole in the middle of her chest.